We invite you to book a Kia Orana speedboat cruise when you come to Aitutaki. Whether you are an individual or a couple, a wedding party, or a group of friends, cruising around the Lagoon and visiting One Foot Island, and Honeymoon Island is one of the most memorable things to do in the whole of the Pacific.We cruise to what we call "the seven wonders of paradise", and every island has something special to see and experience. We offer a daily cruise 6 days per week. Before you know it, you can be swimming, snorkelling or island exploring in paradise! 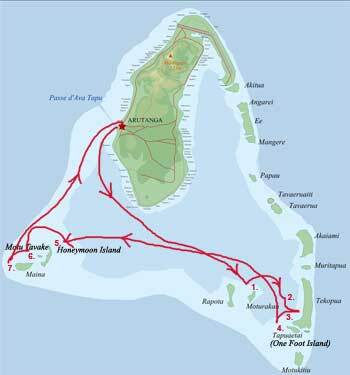 Our Kia Orana Seven Wonders cruise leaves at 09.00 am. We provide pickups from your hotel, supply snorkelling gear, and provide a sumptuous buffet lunch comprising of smoked local fish, fresh local fruit and vegetables. This would be the best day trip we have ever done. Being a small group on the islands you could feel like you were the only ones alive, on the lagoon it meant that the beautiful giant clams, fish and coral was all yours to enjoy, without bumping into people. Nici.